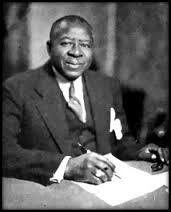 Today in Masonic History Robert Sengstacke Abbott was born in 1870. Robert Sengstacke Abbott was an American Lawyer and News Paper Publisher. Abbott was born in Georgia, the son of two former slaves. Thomas Abbott, Robert's father, passed away while Robert was still an infant. Flora, Robert's mother remarried shortly after. She married John Sengstacke a man with an interesting personal history. "There is but one church, and all who are born of God are members of it. God made a church, man made denominations. God gave us a Holy Bible, disputing men made different kinds of disciples." These words would clearly have an effect on Abbott as he grew up. Abbott would attend Hampton Institute (now Hampton University) to study the printing trade. During his time at Hampton he sang with the Hampton Quartet and traveled extensively. In 1889, Abbott would receive his law degree from Kent College of Law Chicago. Unfortunately due to racial prejudices he was unable to establish a law practice despite trying in several different communities. In 1905 Abbott established The Chicago Defender. His initial investment was just 25¢, roughly $600 today. The Defender would become the most widely circulated black newspaper in the country and was nicknamed "America's Black Newspaper". The news papers would make Abbott one of the first self-made millionaires of African-American descent. Tensions of the time helped fuel Abbott's success. With World War I more and more Blacks were migrating from the South to the industrial North where workers were needed to manufacture goods for the war effort. Through his newspaper Abbott encouraged people to migrate North and even set a date of May 15, 1917 for the migration. He would call the day The Great Northern Drive and would publicize it weekly in The Defender with pictures of Chicago and plenty of space for classifieds for housing. He also would write about how awful the South was compared to the idealistic North, describing the North as a place of Justice and Prosperity. The opening up of all trade-unions to blacks as well as whites. Engineers, firemen, and conductors on all American railroads, and all jobs in government. Federal legislation to abolish lynching. Abbott also used his paper to encourage those who did move North to work for a better lifestyle once they arrived in the North, adopting the first of his nine goals as The Defender's slogan. He once wrote about interracial marriage and laws that would prevent those unions, the "decision of two intelligent people to mutual love and self-sacrifice should not be a matter of public concern." In 1919 Governor Frank Lowden appointed Abbot to the Race Relations Commission. Though some of Abbott's family who still lived in Germany became Nazis, Abbot continued to help people who knowlingly accepted his family history. Notably he would help the family of the owners of his birth father during the depression, this included paying for their children's education. Abbott was a Prince Hall Freemason.